This gown is elegant yet modern. The bodice is a beautiful French lace encrusted with pearls and the bottom half of the gown is floor length with a 2 meter train. 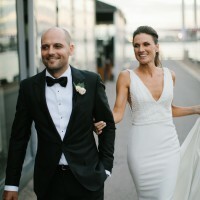 The neck line is a plunging v-neck and the Back of the gown (my favourite) is a plunging back to the waste line, both complimented by the linear design of the lace. I am 165cm tall, size 6, C-cup and wore 10.5cm heels on the day. I had the most amazing day of my life in this dress and I want someone else to enjoy it as much as I did!